Now that the presidential race is finally over—without being dragged out for days as many had feared—weekly news magazines can decisively plan their Obama victory covers. In some cases, that will also mean scrapping a pre-prepared Romney cover. 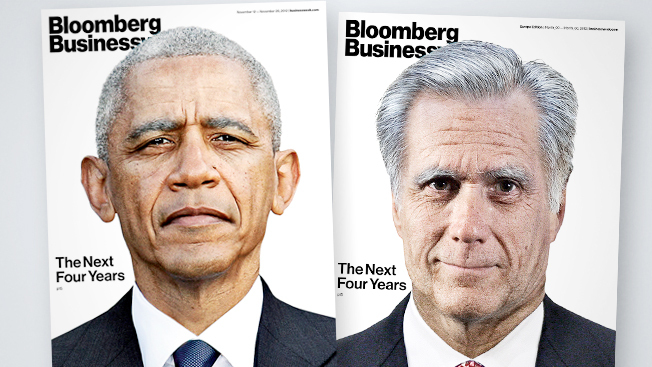 Bloomberg Businessweek is showing off both its Obama and Romney covers even though only the former will actually hit newsstands. Each of the covers, which feature the headline “The Next Four Years,” show digitally aged versions of the president and his opponent. If Businessweek is to be believed, the next four years will be very, very hard on Obama’s appearance. Never mind how much he’s aged since 2004; by 2016, he’ll apparently be a gray-haired, abundantly wrinkled citizen. "No matter how successful he is, the hardest job in the world will take its toll," Businessweek writes. Not that Romney would fare much better in the magazine's estimation. In addition to a rather sagging visage, their 2016 President Romney self sports a very impressive set of bushy, silver eyebrows. So while Mitt might be more than a little disappointed at losing the presidency, at least he can rest easy that the next four years won’t take as hard a toll on his good looks. As for Obama? Consider this advance warning to get started on a rigorous skincare regimen. Meanwhile, Newsweek, which usually distributes its print edition on Monday, is releasing a special election issue that will be available on tablets and newsstands this Friday. A Newsweek e-book by contributor (and former Bush 43 economic speechwriter) David Frum about why Romney lost, and what the GOP can do about it, will also be available on Friday. The cover of this week’s Time, which hits newsstands on Friday, features an image of Obama from his victory speech in the wee hours of Wednesday morning. Taking a cue from outlets like the New York Times and Wall Street Journal, Time is lowering its online paywall and will be offering free access to all content from the new issue, which is usually only available to subscribers. This morning, Time also released a bonus tablet-only election issue for subscribers, which features photos, reporting from Time.com and interactive maps. Non-subscribers can purchase the special issue for $2.99 in the iTunes store.